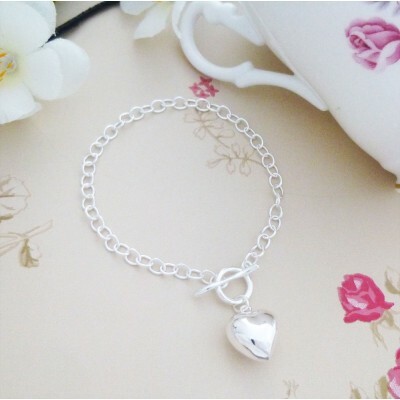 A very pretty puff heart bracelet with a wishbone t bar designed in sterling 925 silver. This is bracelet perfect for a special birthday present or a gift for your girlfriend or loved one. A wonderful puff heart bracelet made out of silver with an intriguing wishbone t bar adding a special touch to this beautifully designed bracelet. This bracelet is suitable for women of all ages and makes the most perfect gift to receive on Christmas day, special birthday’s, valentine’s day or just simply because you want to give your loved one a stunning bracelet they will treasure forever. 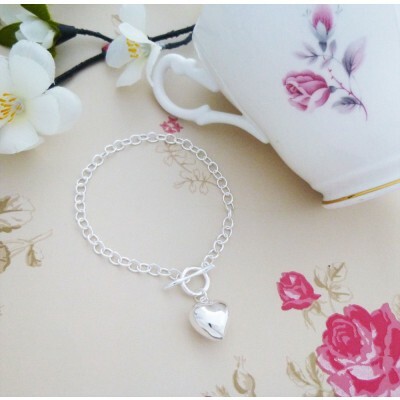 Heart jewellery has always and will always be in fashion which makes this particular bracelet a timeless piece that will be very much appreciated by your loved one. 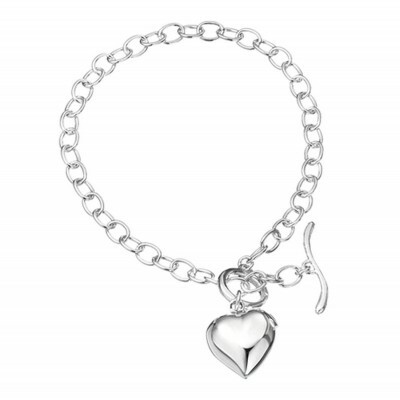 This heart bracelet is lovely to wear and the plump heart charm is perfectly plump and dangles elegantly on your wrist. The Plump Heart Bracelet links section measures approximately 18cm long and the plump heart charm measures approximately 1.5cm x 1.5cm x 1cm. This beautifully designed bracelet is made out of 925 Sterling Silver. This beautifully designed bracelet is made out of 925 Sterling Silver. The Plump Heart Bracelet links section measures approximately 18cm long. Features a plump silver heart charm.